The 10 Percent Rule gets quite a lot of attention in various arenas of life. When it comes to the healthy habits this rule is an important reality to recognize. It’s obvious, all living organisms need energy and they get their energy from the food they consume. How do we humans get lasting energy? Organisms on planet Earth occupy different levels of what is known as food chains. These levels consist of “trophic” levels. 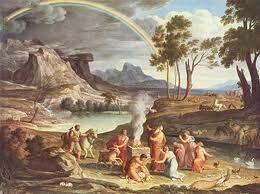 The word “trophic” is derived from the Greek translation of food or feeding. Every community on planet Earth has a trophic structure. These patterns of feeding relationships consist of different levels, as well. Food chains are the successive order organisms eat other organisms. For instance, producers are organisms that produce their own food. Examples of producers are plants and algae. Plants are at the first “trophic” level of the food chain. Consumers are organisms that cannot produce their own food—they need to consume other life form. Consumers are known as herbivores, carnivores or omnivores. Herbivores eat plants;they occupy the second level. Herbivores are plant eating primary consumers like rabbits. Secondary consumers take up the third trophic level. They are referred to as carnivores. They consume herbivores. A fox is an example of a carnivore. 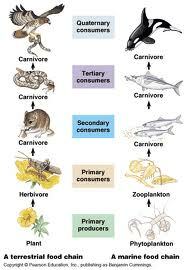 The forth trophic level consist of carnivores, or tertiary consumers. They eat herbivores and other carnivores. Eagles and owls fall in this category. Omnivores eat both animals and plants. Humans, pigs, squirrels, and ravens fall into the class of omnivores. Finally, decomposers like fungus and bacteria release energy by consuming dead plant material and animals and the waste from animals and plants, eventually converting into inorganic chemicals and nutrients for plants to use again and completing this aspect of the food cycle. Have you ever noticed that when you eat white bread or meat you become tired, sleepy, or groggy; you want to take a nap? On the other hand, when you exercise healthy habits and eat vegetables and fruit you become more energetic, more awake? Well, the 10 percent rule will illustrate how energy is lost as we consume organisms higher up the tropic level. The rule suggests that only about 10% of the energy contained in each trophic level is transferred between trophic levels. This becomes stored energy for the consumer. 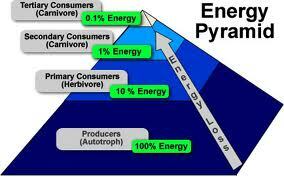 Again, only 10% of the energy stored in each trophic level becomes available to the next trophic level. When humans eat other carnivores, they receive an extremely small amount of energy from their consumption due to the loss of energy between each trophic level. This is one of the reasons why it is far better for humans to consume fruits and vegetables in order to gain energy to perform the tasks we do on a daily basis. There’s power in the number ten. The following video illustrates how we might perceive ourselves in the fantastic scheme of life. This is a common misunderstanding of the ten percent rule. The ten percent rule explains why it takes so much more basic life to feed higher food chain life, not that there is some magical loss of energy as you go up the food chain. Yes, there are absolutely billions of reasons to eat fruits and vegetables, the inflammatory, antioxidant, and fibrous qualities alone are excellent. But to state that “you feel tired when you eat meat” could be attributable to many different reasons, from unhealthy gut flora, leaky gut syndrome (most likely), tryptophan in the meat, general poor digestive health (many many causes of this as we age, and they can be staved off), or just eating poor quality meat, or too much meat at a time. And yes, raw foods have enzymatic content, essential for life, and usually more nutrient content. So eat fruits and veggies instead of piles of crap quality meat, for all the right reasons, not based on a misunderstanding of physics. An antelope, or a cheetah, are TEEMING with vibration and energy. Don’t be misled. Thank you George for the very interesting article. As a chef, I am always interested in nutrition, health and well-being but I have never heard of this before. Plants have thousands of Phytonutrients that our bodies need to thrive which we can not get in animal foods. I believe also that the 100% energy comes from plants in their raw state before cooking. Thank you as well, Robert! Thank you for sharing your thoughts and beliefs on this material! Now I’m studying abroad in Japan alone, and this article reminds me of the importance of consuming fruits and vegetables, especially for my circumstance in which I have to take care of my health by myself! It’s always good to know what going in and around you, Kevin. I’m personally glad to see we can help in reminding ourselves to look out for one another. This is interesting and I had to read over it a couple times to really get it. Thanks for always adding value and helping us on our wellness journey. Thanks for taking time to read this article, Ken! We always look forward to your critique and opinion! Thank you for taking the time to read and comment on this latest article, Armi! We look forward to hearing from you in the future! We also appreciate you sharing your thoughts and insight on this topic, Lynn! You’re absolutely right, in that walking is a healthy habit and an essential prerequisite to stimulation to our brain and overall good health. I wonder why I get tired after eating certain foods. The video is great! I like how you described how the food chain works. It’s good to see you’ve received something from the material!